Japan's trade trends continue to sour with a widening deficit, weakening exports and strong imports. Year-on-year goods exports are only technically rising with a ‘gain' of 0.2% over 12 months, hardly more than zero. Imports of goods, however, are up by 13.4% over 12 months. These trends, of course, are expanding Japan's trade deficit again. This is mainly an issue of fading global growth and strong commodity prices as changes in competitiveness and in exchange rates have been small. The yen vs. the dollar has fallen by 0.5% over 12 months, a negligible change in value. The broad yen (the yen's value assessed and trade weighted vs. a large basket of currencies) has risen by 1.5%, also a negligible change over 12 months. Japan's exports are stuck because global demand is weak and weakening. Japan's two main markets are the United States and China. China is slowing and being affected by the U.S.-China trade war even though that ‘war' has been put on hold. The U.S. is growing better than China (at least relative to its trend), but the U.S. has also showed signs of slowing down. Not only have overall Japan trade flows become skewed, but Japan's imports of motor vehicles have sped up and its exports of motor vehicles have slowed and are declining. 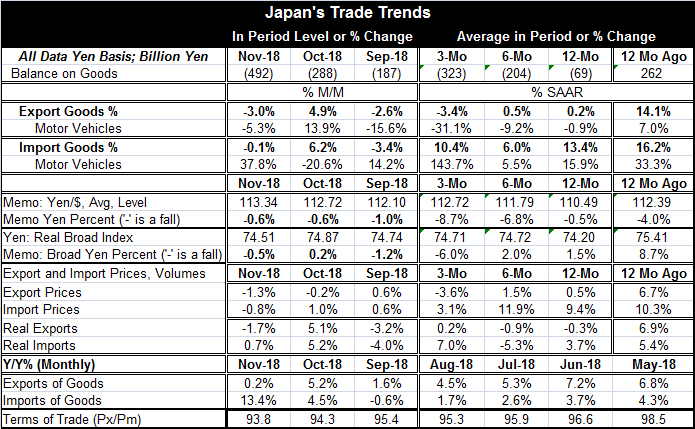 This is a new trend since over the previous 12 months Japan's exports of vehicles showed expansion but its imports are now at high growth rates for two years running. Underlying these nominal trade flows are some interesting trends in prices and trade volumes. Over the past year, Japan's export prices are up by 0.5% while export volumes are off by 0.3%. On the face of it, that looks like weak demand. Demand is weak in volume terms and so weak that substantial price gains are not sustainable. It contrasts sharply with imports where prices are up by 9.4% over 12 months and import volumes are up by 3.7%. And we know that demand in Japan has not picked up substantially on this period. But energy prices have been high and only recently have begun to weaken. Japan's trade picture should improve as weaker prices for energy imports filter through the trade process. Japan like other countries has ‘skin in the game' over the U.S. monetary policy decision today. If the Fed does go ahead with a rate hike, there could be several effects in train as a result. Higher rates will act (moderately) to slow growth; they could help to push the dollar to a stronger level and that could reduce commodity prices that in turn could bring pressure to bear on developing economies that depend on the export of commodities to earn foreign exchange. So a rate hike from the Fed could work its way through various sources and have a chilling impact on global growth. Add to that any fallout from trade wars or from the Brexit process which is looking clearly like a case of the best laid plans and attention gone to pot. Global growth is being challenged in many ways. The U.S. is stirring the pot trying to create better opportunities for itself rather than to allow old Post-War relationships to govern trade relations some 60 to 70 years on. Preferences that the U.S. accorded to trade partners in the Post-War period are no longer suitable to the economics of the day. Germany gets preferences, and has a security blanket thrown over it at mostly a cost to the U.S. tax payer. Meanwhile, the U.S. runs large fiscal deficits and has a structural current account deficit while Germany has a fiscal surplus and the highest ratio of current account surplus to GDP among major trading nations. Clearly, circumstances have evolved that are out of step with the times. Japan is feeling pressure from Russia that is taking a page out of ‘The Book of China' and is beefing up bases on islands that are claimed by both Russia and Japan. Japan sees threats around it from a more aggressive China as well as Russia and is planning to beef up its air force. In the Post-War period, both Japan and Germany benefited from a protective stance of the U.S. that freed their resources to be wholly devoted to the economy recovery and growth. The need for those special arrangements has passed, but there is no consensus over what happens next. As a result, geopolitical alliances are in flux. And these sorts of fundamental relationship shifts have also important economic consequences. I find it odd that the U.K. continues to provide military support to Europe despite the EU's stonewalling behavior and less than generous offer to the U.K. over Brexit. The U.S. and China are planning more trade talks early next year. The U.S. and the EU have talks percolating that we do not hear much about. There are still ways in which trade conflicts can be resolved or can pop up to become a second wave of problems that global growth will have to deal with again. A second wave would probably be more than global growth could bear up under. Trade policy remains something to watch very closely and to be kept right there on the front burner where it can be monitored.